In the wake of Nat Randall and Anna Breckon’s success with The Second Woman, it’s time to consider the film and the performance that inspired it, celebrated in a superb article from 1994 about performance and identification by Lesley Stern. “I’m not me. I used to be me. I’m not me anymore,” says Myrtle Gordon, extemporising freely and playing for laughs. 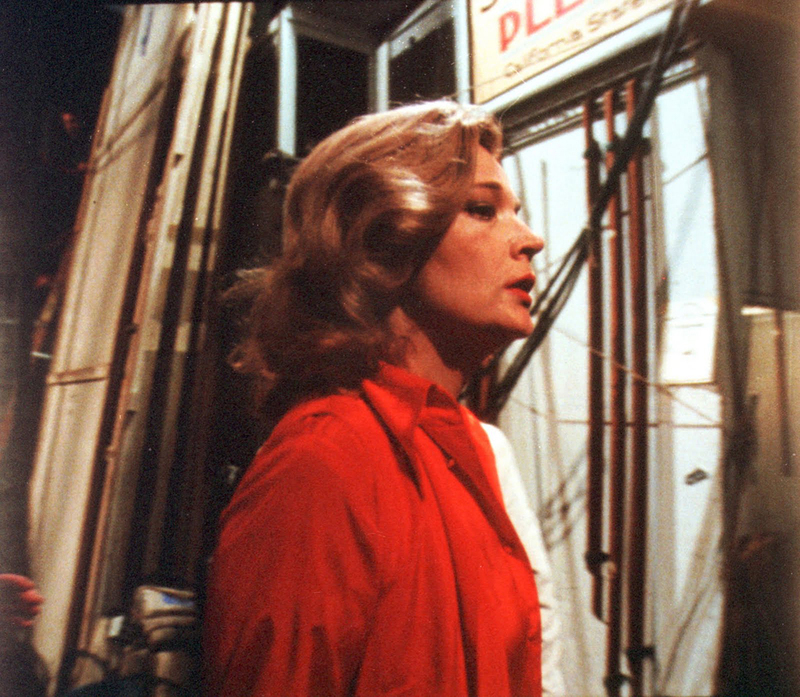 Or perhaps it’s Gena Rowlands who speaks here — acting out for all she’s worth and upstaging her own character. It’s the Broadway opening night of a play called The Second Woman and she, the famous actress, has arrived late and gone on stage so drunk she can hardly stand. But we are not actually at the theatre — we are watching the final sequence of a film called Opening Night (John Cassavetes, 1978) which tells the story of Myrtle Gordon (Gena Rowlands) and the difficulty she experiences in playing the part of a woman unable to come to terms with ageing. Opening Night a film is pertinent to current interests: it theatricalises the body, particularly the female body, and dramatises the self — as performance. But to tell the truth, I’m only writing this because I want to contemplate the incomparable Gena Rowlands, to watch this movie over and over again so I might come to know through her many faces, her every quizzical gesture and gut-wrenching grimace, each goofy trick she plays, how it is she’s so sublime. Perhaps I want to be Gena Rowlands. Well yes, but not entirely, for part of me wants her to remain other, out there, up on the screen. I want to watch her again and again because of this: for all the harrowing intensity that frequently accrues to her presence I emerge from her films exhilarated and invigorated — always it is as though I have been taken by surprise, have seen and experienced something new. In performing, Rowland enacts the declaration, “I like to act” — and this makes me believe that I too can be an actor. Yet it isn’t simply a showing off of pleasure that is inspiring, it is as though the history of herself as a performing body, the skills that have been learnt in her previous stage and film incarnations — in earlier Cassavetes’ films for instance, such as Faces (1968), Minnie and Moscowitz (1971) and Woman Under the Influence (1975) — are written into each role she plays — who knows — there is the possibility that I too can learn those skills, can aspire to a more decidedly nuanced body and way of being in the world. Gena Rowlands is an actress who particularly foregrounds acting as a process of production (as an engendering of the body) and Opening Night is a film that is particularly concerned with various regimes of fictionality (film, theatre, the quotidian) and also with the very question of identity and identification. It explores the question of how to act: on the most mundane level — how to act when the world and self are disintegrating; and on a more specialised level — how to act on the stage, how to perform a fictional identity, how to seduce an audience. How to act: for Myrtle this problem is acutely professional and therefore practical, but insofar as it is a matter of identity, it is not separate from her personal or ‘private’ life. It has to do with the troubled relationship between character and actor and with the way in which fictional energy exploits this tension to generate belief and knowledge (and love and despair). Likewise, the film struggles to find a way of articulating this tension. The film itself and the filmic body are both subject to disintegration and marked by resilience. This tensile reciprocity characterises what I call histrionic cinema. While ‘histrionic’ denotes something about film that is actorly, I use the notion to refer to more than the register of acting. Rather, we might say that in the histrionic a particular relationship exists between the actorly performance and the filmic; the film is conceived within the parameters of a dramaturgy that is not centred on character, but this is nevertheless charged by an intense investment in acting. The cinematic codes tend to be ostentatious and their very amplification owes something to the theatrical imagination — not theatre in terms of staging or even representation, but in terms of an enactment, a fictionality realised through a world that is acted out, in the process of acting up. This suggests the creation and mobilisation of a world that is fraught with surplus value, a world in which objects, scenic terrains, the cinematic landscape itself, are charged as if by the supernatural, as if possessed. There are two pivotal ‘events’ in the film. Firstly, what I refer to as the “slapping scenario” — there is a scene in The Second Woman where Virginia has to be hit across the face; Myrtle simply cannot play the scene, and a great deal of drama is generated around her struggle to play and simultaneously resist. Secondly, Myrtle is haunted by a ghost, a young girl fan who is initially comforting but turns extremely nasty so that Myrtle eventually has to exorcise her in an extremely violent encounter. Myrtle’s problem is not that she confuses on-stage and off-stage activities but that she condenses two moments: the girl being hit by a car in the street and herself being hit on stage. The difficulty she has in playing the slapping scene is not to be construed simply as a refusal of violence; more profoundly — and less coherently — it is a resistance to passivity and resignation. It is not the slap in and of itself that troubles and confuses her; in fact the condensation she performs (and the film enacts this cinematically) poses the slap as a gestus that actualises the discursive violence she is experiencing. And her conjuring up and eventual exorcism of the ghost is a way of transforming the scenario. It is often unclear — during all the rehearsals, improvisations and enactments — whether we are watching, in Myrtle’s hysterical reactions, a consummate drama queen going over the top, or simply a woman cracking up. I think both. At once. Myrtle refuses the terms of the transaction, the brutality of the representational act, but her refusal is not considered, not subject to planning and judgement; something in her refuses — to grow old gracefully, to submit to passivity and being without weapons — but her refusal is inchoate, non-discursive, primarily somatic. It is however a process of improvisation, of working out how to play this part. And it absorbs us because of Gena Rowlands’ acting, her fictionalisation, and the way this is articulated by and with the cinematic codes. Her ‘crack-up’ is made manifest through a skilful deployment of energy, of bodily rhythms, of shifting vocal intensities. And these modalities are echoed by the camera’s insistent unblinking attention, the long takes often in extreme close-up, hovering and hand-held, the juxtaposition of angles and the sudden recourse to extremely distanced long shots. We know that she (Myrtle) is playing a part or parts, and we know that the identity between the actor (Gena Rowlands) and the character/s (Myrtle and Virginia) is precarious, yet the more we know “the more difficult it is to believe and the more it is worth managing to do so.” (Jean-Louis Comolli). Myrtle: Well, I am not me! Marty: And I know that I am someone else. Myrtle: Do you think I am too? Myrtle: OK, it’s definite then! We’ve been invaded. There’s someone posing here as us. And you’re right, there is definitely something wrong with your smile! What I have referred to as the “I like to act” dynamic opens a space both of identification and contemplation. When Gena acts out the trope “I like to act,” I believe for a moment or more that I too can be an actor; I don’t primarily believe that I am her — Gena or Myrtle or Virginia (though I might get caught up in various regimes of fictionality) — but I know that I too can act differently, be somehow other. 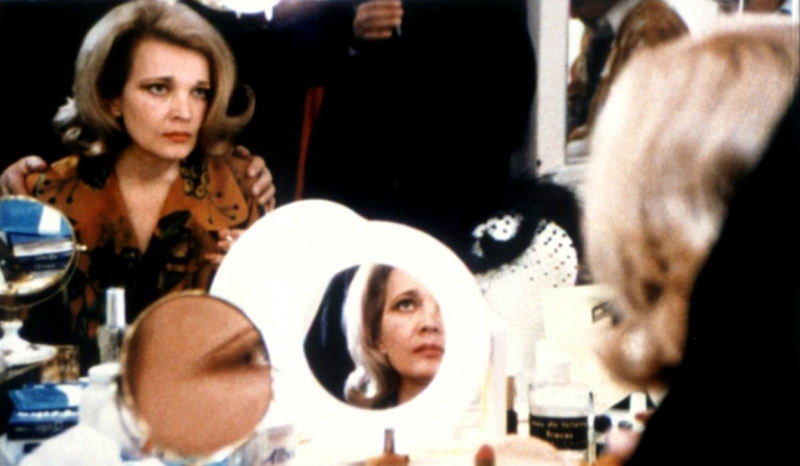 Three films by John Cassavetes featuring Gena Rowlands — Faces (1968), A Woman Under the Influence (1974) and Opening Night (1977) — are included in a 2004 Criterion DVD box set. Minnie and Moskowitz (1971), Gloria (1980) and the sublime Love Streams (1984) are individually available on DVD. Lesley Stern is a US-based Australian film scholar, writer and academic, author of Dead and Alive: The Body as Cinematic Thing (2012), the Scorsese Connection (1995) and The Smoking Book (1999).